When it comes to aggressive legal representation of the injured across southern California, victims have been turning to Ellis Law for over 25 years. From car accidents and malpractice to product liability claims, our attorneys are accustomed to bringing a wide range of techniques and resources to bear in achieving the positive outcomes our clients deserve. If you’ve been injured in a car accident, suffered an injury on someone else’s property or been hurt in a slip and fall accident, you have the right to take legal action. A Long Beach personal injury lawyer will make sure that you are equipped with a knowledgeable lawyer that will fight for the settlement you deserve. We take a personal approach to all injury cases, taking the time to get to know you, your story and concerns for the future. Long Beach Personal Injury Attorney- Andrew L. Ellis Andy Ellis is one of the most successful Personal Injury Lawyers in California. Meet Mr. Ellis and find out how he helps his clients who have a personal injury case. http://ellisinjurylaw.com. We know that if you’ve been hurt because of someone else’s negligence, you’re probably facing serious financial hardships and confused about where to turn. Our skilled attorneys are here to answer questions, help you understand your rights, and build a compelling case against the responsible person or entities. We are proud to offer clients the ability to meet in our Long Beach law office, conveniently located on West Ocean Boulevard. If you or someone you love needs experienced legal counsel, you are welcome to visit any one of our 20 California office locations for a free case evaluation and consultation. At Ellis Injury Law, our attorneys handle a wide variety of cases, ranging from minor injuries to catastrophic loss. We are a full-service personal injury law firm, which means we have the knowledge, resources and legal savvy to handle many types of civil litigation, with the goal of achieving the best results for clients. Our one goal is to help our clients put their lives back together and heal emotionally, physically and financially after an accident. Whether your injuries were caused by a prescription medication, a drunk driver, or a negligent workplace supervisor, you can put your trust in Ellis Law to fight for full and fair compensation. Victims of negligence can rest assured that our legal team will conduct an extensive investigation into the circumstances underlying their losses and develop persuasive arguments and negotiation strategies to maximize legal recovery. Working under the sage guidance of founder and Senior Partner Andrew Ellis, Ellis Law has indisputably established itself as one of the most successful and respected firms in Southern California. The firm has garnered several prestigious legal awards and accolades for their accomplishments, earning inclusion in the American Board of Trial Attorneys, the Million & Multi-Million Dollar Advocates Forum, and the Lawyers of Distinction Directory — which recognizes the nation’s top 10 percent of attorneys in their field. Our legal team is comprised of top-of-their class professionals, including Associate Counsel Britt Karp, who practiced civil defense and insurance coverage litigation prior to joining the firm in 2011. Ms. Karp now specializes in complex claims involving catastrophic injuries and practices in state and federal courts. Here, trial attorneys and dedicated support staff work diligently to get the best possible results for our clients, and our dedication to comprehensive, compassionate service is what distinguishes us from the pack. With nearly three decades of combined experience representing motor vehicle accident victims throughout California, our firm poised to help clients win the monies needed to recover fully while obtaining some measure of justice. We work with a network of physicians, case investigators, accident reconstruction analysts, economic loss experts and others to maximize the value of your case. Accidents involving rear-end collisions, vehicle rollovers and distracted drivers tend to be extremely fact-intensive scenarios requiring thorough investigations, expert analysis and meticulous evidence gathering. We leave no avenue unexplored when it comes to establishing liability and proving damages. If you or someone you care about has been injured in an auto accident, we encourage you to reach out for a complimentary case evaluation. We’ll listen to your story, outline the merits of your case and determine if you have a viable claim for monetary damages under California law. From its inception, this firm has been rooted in the philosophy of helping protect the rights of the injured. Throughout his illustrious career, Andy Ellis has honed his trial expertise, winning lawsuits involving life-altering injuries and multiple defendants. The firm is nationally recognized for delivering superior advocacy in multifaceted cases in which plaintiffs are left with severe and sometimes permanent disabilities. Over the past decade, Andy has recovered millions of dollars on behalf of clients whose health and happiness were compromised because of another party’s reckless actions. Renowned for his results-oriented approach and numerous trial victories, Andy is also praised for playing fair with the opposition. Perhaps more importantly to clients who suffered crippling injury, Andy Ellis has the experience and drive to take the case to trial and win. From brain injury and amputation cases to those alleging wrongful death, we have procured landmark outcomes for many satisfied clients. Our firm enlists the best medical experts and specialists who can document the full extent of your injuries and projected losses ten days from now, and ten years from now. We will fight for all past, present and future costs relating to your injuries, including nursing care, in-home modifications, assistive devices, rehabilitation and even psychological counseling. Whether accomplished through aggressive insurance negotiations, at mediation, or by taking your case to trial, we are prepared to handle a wide variety of challenging cases with catastrophic and disabling injuries. When you retain our legal services, you don’t just get top-tier trial lawyers– you get an entire practice that is dedicated to the success of your injury claim. Under the leadership of Andy Ellis, our law firm has recovered more than a quarter billion dollars for clients across southern California. In fact, our attorneys have a 99% track record of success when we accept a client’s case. Filing a personal injury lawsuit in California is no easy task, as there are multiple factors that influence a positive outcome for claimants. During a private consultation, our attorneys will explain the best legal strategies for pursuing compensation, while expanding on these frequently asked questions. Defendants and their insurers will try and pay the bare minimum on claims. In order to seek full damages in your case, you need convincing evidence of both economic and non-economic losses. It must be proven that the defendant’s actions or inaction caused your injury, thereby reducing the quality and enjoyment of your life. Because each legal matter has its own facts and circumstances, there is no calculator for assessing the value of your case from the outset. However, attorneys can offer the settlement amounts obtained in earlier cases involving similar allegations and injuries. What is the Statute of Limitations to file a claim in California? Under California law, injury victims have two years from the date the incident occurred to file a claim for damages. This is known as the statute of limitations. In cases where a governmental entity is named one of the defendants, this time limit may be shortened to just six months. Pursuing litigation in California is time-sensitive. If you wait too long and the statute runs out, you may no longer sue for your financial losses, pain and suffering. Don’t risk losing your right to compensation, call today for a no-obligation case review. Lawsuits can be costly and time consuming for both parties, which is a great motivator for defendants to settle early. Plaintiffs who need to settle quickly can often do so, but at their own expense, as adjustors will pay pennies on the dollar. A good attorney will wait until clients have reached maximum medical improvement before attempting to negotiate a settlement. This enables your legal counsel to more accurately value your damages and the total value of your case, since your “recovery” is complete and you’re not likely to improve any further. This may delay the settlement process in some cases involving large damage awards. Free Case Evaluation. 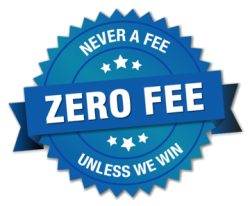 No Fees Unless We Win Your Case. It is our firm belief that finances must never stand in the way of justice. We routinely accept cases on a contingency basis. What this means is that clients are never required to pay legal fees until and unless we succeed in securing an award of financial compensation in their matter. Prospective clients who have been harmed through no fault of their own must never hesitate to pursue fairness just because they lack sufficient funds. We have the resources to finance your case, from start to finish. If we don’t win money on your behalf, we do not get paid. There is never any risk to you, the client, to receive unparalleled legal representation of the highest caliber. Clients of Ellis Injury Law can expect an unsurpassed level of communication with our team of professionals, quick response to questions and concerns which may arise, and a degree of zealous advocacy we believe cannot be matched. It is our belief that injury victims are entitled to receive detailed information about the direction of their cases so that smart, timely decisions can be made about the representation we provide. Though we will make every effort to secure resolution through settlement negotiations at an early stage, if that proves unlikely, we are fully prepared to bring our decades of trial experience to work, seeking the full and fair recovery each client desires. At Ellis Law, it is our belief that a fruitful attorney-client relationship is built on open communication and easy accessibility. As a result, we are proud to offer clients the ability to meet with our team of professionals at our Long Beach office, located on West Ocean Boulevard.